How did the ecosystem evolve? While deciduous woodlands may not be as familiar to many British Columbians as coniferous ones, they are one of the most common vegetation types in the temperate climates of the world. Before the ice ages, British Columbia also had a varied hardwood forest with many kinds of deciduous trees, including oaks. 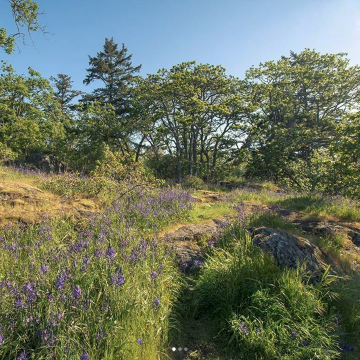 Garry oak woodlands are an important link to the past. Garry oak distribution has ebbed and flowed between the ice ages. During the current post-glacial period, Garry oak forests reached their largest extent during the warm dry era, 5000 to 8000 years ago. Garry oak ecosystems may have a special role to play in British Columbia's adjustment to global warming. It is predicted that our climate will become more like that of California. With Douglas-fir ecosystems retreating from their current range, Garry oak vegetation could provide the important biological material to maintain forest cover. Garry oaks and the plants that grow with them adapted to frequent fires. Fire is important because it allows oaks to occupy deeper soils, where conifers might outcompete them. Oaks are favoured over conifers and annuals; and perennial plants over shrubs in places that often burn. We know that local First Peoples burned the plants under the oaks throughout their range to maintain open prairie, to make hunting easier, and to allow the land to produce more food, like Camas. Camas was so important in their diet that families had their own plots of woodland where they owned the harvest.